Comments Off on How to recycle electrical equipment ! HIn the UK each year in excess of 170 million electrical items are purchased. This equates to around 3 appliances or gadgets per head nationwide. Some people may think this is a conservative calculation when they think about the electrical items in their own household. What Are The Top 5 Recycleable Materials ? Comments Off on What Are The Top 5 Recycleable Materials ? Knowing what can be recycled may seem like a difficult subject at times. Many households now have special bins for different kinds of rubbish but knowing if your waste is the ‘right kind of recycling’ can be confusing. We’ve compiled a simple list of the top 5 materials that can be recycled and why. We also know how problematic it can be getting rid of your unwanted items so if you have any waste issues you need help with then it could be worth giving us a call. 1) Aluminium & Steel – empty drinks cans and other items made from aluminium are 100% recyclable. What’s more is that the energy used to make new aluminium from recycled waste can mean a up to a 95% reduction. Steel is also completely recyclable and making new steel from old is a real energy saver overall. 2) Cardboard & Paper – Breaking down boxes instead of chucking them in the household waste can make a significant energy saving. Along with paper it is one of the most readily available commercial and domestic waste products. In the UK we get through around 12.5 million tonnes of cardboard and paper each year and it takes 24 trees to make 1 tonne so recycling what we can is obviously important. 3) Glass – Savings of up to 50% energy could be made by recycling glass products. It uses much less air and water pollution and take note as any glass that does get to landfill will never decompose. Glass is also 100% recyclable. 4) Plastic – Currently considered the enemy by pretty much everyone and whilst it is the cause of much debate lately it is shown to be on the rise by around 4% each year in Western Europe. Annually it is estimated that a family will throw out 40kg of plastic that could be recycled which is staggering considering it takes 500 years to break down and decompose. 5) Computers/Technology – With the fast pace of technology development it may not be a surprise to find that this makes our top 5 list. Reusing or sending old computers, laptops and other technology to recycle centres could mean there is less waste and parts can be reused. DEFRA is said to be considering responses from a consultation that they opened back in January. Part of the consultation was the possibility of fines being introduced for individuals that don’t take ‘all reasonable measures’ when employing someone to dispose of their household waste. This proposal very much places the onus for reducing fly tipping with the householder as anyone found to be hiring unlicensed waste companies could be fined up to £400 if the waste is then found to be tipped illegally. The proposals go further than ever before to tackle the issue of fly tipping which is thought to be on the increase and is problematic in rural and country locations throughout the UK. According to figures household waste is effectively two thirds of illegally tipped waste and so this proposal is thought to be a solution to the problem. Until now the introduction of on the spot fines as well as the fact that waste carriers must have a license have had less of an impact on fly tipping figures. It was reported last year that on the whole fly tipping is still on the increase for the third year running and so it is hoped that these new measures under consultation could have the desired effect. The maximum fine is suggested to be £400 with £200 being the default minimum. For many people the proposals are a welcome prospect as certain areas in towns and cities are repeatedly suffering at the hands of illegal waste tipping. 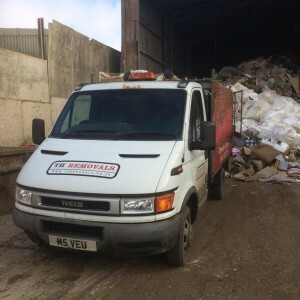 Finding a licensed waste carrier like TH Removals is very straightforward and we will gladly help people to dispose of excess waste in a responsible and efficient way. We understand how difficult it can be to get rid of unwanted items and bagfuls of waste but we are committed to providing a thorough and proper waste removal service to all households in Hertfordshire, Bedfordshire and Buckinghamshire. It is important for anyone getting rid of rubbish to request to see the relevant waste carriers license to ensure the firm is reputable. Waste news in 2017 seemed to be dominated by two major things – the reduction in kerbside bin collection by many councils in the UK and the rise in fly tipping in areas across the country. The latter is seen to be a direct result of the reduction in bin collections with householders looking to offload quite literally anywhere, rather than dispose of waste lawfully. It is predicted that in 2018 the trend for a rise in fly tipping incidents could increase and with the last financial year reporting an equivalent of 114 incidents an hour this is a depressing thought. There are however plans to try to change how those caught fly tipping are dealt with including the possible introduction of fixed penalties rather than put people through the courts. This is just one consideration that is the possible result of an ongoing Government consultation. It is of course already illegal to allow someone without a licence to remove waste but the punishment can be a long process. Treating those that fly tip by way of a fixed penalty notice could add a further deterrent. Part of the Government consultation could even see householders taken to task for failing to take ‘reasonable measures’ when hiring someone to clear their excess household waste. The proposals could see fines up to £400 if found liable in these circumstances, the idea being that putting the onus on employing a legitimate waste removal carrier in the first place. 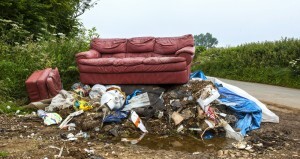 Councils can already issue fixed penalty notices for small scale fly tipping offences but this could see the responsibility to pass to the householder to find a reputable and licensed waste carrier. Local councils via the Local Government Association are keen to quash any connection between charging for bin collections such as garden waste and the increase in fly tipping. They argue that easier reporting methods have contributed to the rise in fly tipping figures. However on the ground there are visibly more problems with people dumping waste elsewhere and general discontent with collection methods and frequency of collections. Plastic is everywhere – quite literally and not for any good reason. Every day it seems we’re being bombarded with images of plastic strewn all over our beaches and oceans. All this despite the fact that efforts to recycle are higher than ever before with many UK households having plastic recycling bins and collections as standard. Quite why this is happening we’re told is down to the type of plastic itself. In the UK we don’t have the technology or enough of it in order to recycle particular types of plastic on a large scale. So regardless of our efforts to recycle we are still falling short and our plastics aren’t quite being recycled and repurposed as we had imagined. Refuse plastic straws and plastic cutlery: Using a straw for drinks might be second nature. However switching to paper straws or just not using one altogether could be much better for the environment. Taking your own cutlery might be harder to remember but could be well worth doing. Take a reusable cup: Hot drinks cups have come under fire most recently with a so called 25p coffee tax being considered in parliament in order to try and cut down on this waste. Taking a reusable cup with you could be an easy way around this big waste problem, especially when considering 2.5 billion cups are thrown away in the UK each year. Remember your reusable carrier bag: The 5p tax on carrier bags has been introduced already with an estimated 85% drop in usage. Carrying a bag with you at all times could prevent being caught out. Get milk delivered: It might seem like a thing of the past but using a glass bottle delivery and re-use service could cut down on plastic bottle consumption. Reduce plastic packaging purchases: It might be harder to avoid but using less packaging could reduce plastic consumption. Buying loose fruit and vegetables and avoiding or substituting products that are heavily packaged in plastic could be a good alternative. 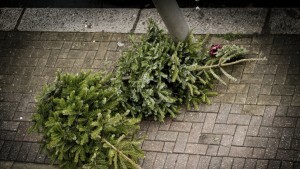 When it comes to Christmas there is probably no other time when as much waste is generated. Lavish indulgence with additional food, Christmas trees, tree lights, cardboard, present packaging, toys, games consoles, wrapping paper and Christmas crackers all contribute to the waste the UK creates around the festive season. This list is not exhaustive either! Figures in 2012 from Wrap (waste reduction advisory body for the UK government) it was estimated that Brits throw away the equivalent of 2 million turkeys, 300,000 tonnes of card packaging and 74 million mince pies each year. The sheer volume of waste is mind blowing with each UK householder spending £169 on food and wasting 30% more than normal, all at a time when bin collections are reduced and services even more stretched. The financial and environmental implications of all this excess is simply overwhelming with councils urging people to think more carefully about their purchases and what they recycle over the Christmas period to stop such a burden on waste services. Research waste provisions – it might not be normal to plan what you’re going to throw away before you’ve even consumed anything but knowing when bin collections are happening over Christmas and either cutting back or planning to recycle more may help. Find out where local recycling centres are to do a drop yourself or engage with private waste removal services who may offer additional services over Christmas and New Year. Go easy – sure it’s Christmas but the waste generated is both phenomenal and unnecessary. Simple things like planning a food shop in advance, using frozen food where practical to avoid fresh food going unused or perishing. Online meal planners and party planners might help to hone in on the things you really need rather than overstocking. Buy gift experiences rather than tangible items – finding the balance between having gifts to open on Christmas day and having nothing might seem tricky for some but actually buying a gift experience could create a more memorable and special gift for someone. There is always one person that is difficult to buy anything for so instead give them the gift of your time and take them out for dinner or a day trip to somewhere festive. As councils find their budgets squeezed ever tighter many areas have found that services that were previously free now have a hefty charge attached. One such ‘luxury’ is in the area of waste where so called bulky collections now have a fee in order for the council to come out and collect and dispose of such items. A bulky collection may consist of a single over size item such as furniture or white goods or it could simply be waste that doesn’t fit in the regular waste collection. The impact of charging is facing blame for the most part for the increase in fly tipping nationally. Recent Government figures published show that across England fly tipping rates have increased for the third year running. Only Nottingham City Council reported a 42% drop in fly tipping as one of the few remaining councils still offering free bulky collections. Despite hefty fines for fly tipping reports suggest that only 0.2% (2135) of cases resulted in prosecution in 2016. All this despite a £50million bill for taxpayers to clean up the mess left by flytippers with items such as household waste, furniture, grass cuttings, tyres, car parts and fridges a regular feature on UK roadsides and laybys. An alternative to council costs or illegal activity could be engaging with private services that may often give a more competitive service to householders or businesses when disposing of waste. Private companies may also be much more responsive when it comes to understanding the needs of people trying to remove waste from their property and could also offer related services such as skip hire or house clearances that could prove useful. This alternative could be a welcome option as people begrudge “paying twice” for council services and are further incensed by imminent plans by many councils to introduce charges for garden bin collections. Despite the majority of householders totally opposed to garden waste charges some councils have already introduced the charge with more set to follow, setting a fee of circa £40 on top of their existing council tax charge each year.